I don’t homeschool but I’m intrigued by homeschooling. In particular, how homeschooling parents motivate their children to study successfully. Motivating young children can be difficult for even the most experienced teacher. My own memories of school are that 80% of the time I was bored (conservative estimate!). Keen to support my own children, outside of school, I’m always investigating various approaches to education, and how I can keep my kids interested in learning for the rest of their life, and it is not a chore. My children attend state school, one still primary age and one at high school. I want them to do well, to learn lots – but of the greatest importance is that they enjoy the hours between 9 and 3 (give or take half an hour or so). 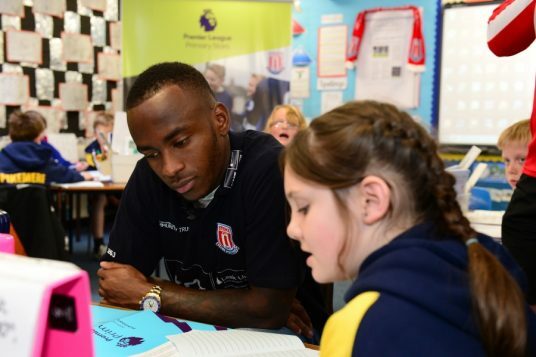 It was a privilege, therefore, to be invited along to a primary school to observe how they are engaging their pupils in maths and literacy, with the help of Premier League Primary Stars. For those of you who have not heard about #PLPrimaryStars, please let me introduce you to the project that is inspiring primary school children in everything from English and Maths to teamwork and sport. Premier League Primary Stars is using the appeal of the Premier League to inspire children to learn, be active and develop important life skills. Let’s return to my visit to Pikemere County Primary School. Last Thursday I received the warmest of welcome from staff and pupils at Pikemere, and also from Stoke City FC and their community trust, who were in school that day to spend time with a class of students. I walked into the classroom to a rapturous round of applause, alas it was not for me – but rather the famous Premier League football player just a few feet behind. If you’re a UK reader, as a nation of football fans, there is a strong possibility you’ve heard of Saido from Stoke City FC – the children most certainly had. Once the adoration had died down, it was time for questions. The children had prepared plenty in advance to ask the striker. Their questions ranged from ‘how old were you when you started playing football?’ (answer: age 9) to ‘what was your favourite subject at school?’ (you may be able to guess the response to that one? answer: P.E!). Inspiring also to learn that Saido supported Manchester United as a child growing up in Africa, and as a Premier League player his most memorable match was when he scored the winning goal against his former favourite team at their own ground – Old Trafford. We tell our children not to let go of their dreams – here was a real life example of how they can come true. As I said – inspiring. After question time it was the Pikemere pupils time to shine. It was an opportunity to show Saido their hard work, and this is where Premier League Primary Stars is supporting the teachers of the school with resources. Going from table to table, the children each had time to talk through their match report with the Premier League player. The school had previously chosen the Everton Vs Stoke game to scrutinise, which I am told had a rather controversial goal – always good for a lively discussion! The engagement of the children was undeniable, it wasn’t quite what I was expecting from observing a literacy class. They had a genuine interest in what they had written and were eager to share. Convinced I too was a celebrity of some sorts (rather than just a boring blogger) I caught the eye of the table of four (2 boys 2 girls) to whom I was close by. One boy explained that Premier League Primary Stars was ‘Really fun!’ despite the fact that he didn’t even like football (that made me smile). The girls definitely had enthusiasm for the beautiful game, and without a doubt there was a budding sports reporter in the making, also sitting at the table – his match report worthy of airtime in my rookie opinion. As match reports were discussed around the room, I grabbed a few minutes with the teachers, including the Head of the school. My burning question was how as teachers with so much to cover in the current curriculum can they find time to fit anything else into the school day? Pikemere addressed my concerns convincingly. The school does not see it as an additional thing to do but rather a different approach to delivering a curriculum which they have a duty to do. Premier League Primary Stars is a partnership with a school. Teachers can make it what they want – it can be bespoke to each individual school and class as needed. So what else had the children been up to? Well, they’d visited the Stoke City FC ground and that prompted many discussions in the classroom crossing many areas of the curriculum. The staff explained how the visit to Stoke City FC had brought the work they were doing to life and made it three dimensional, rather than just looking at flat images on a whiteboard to ignite the pupils’ imagination. 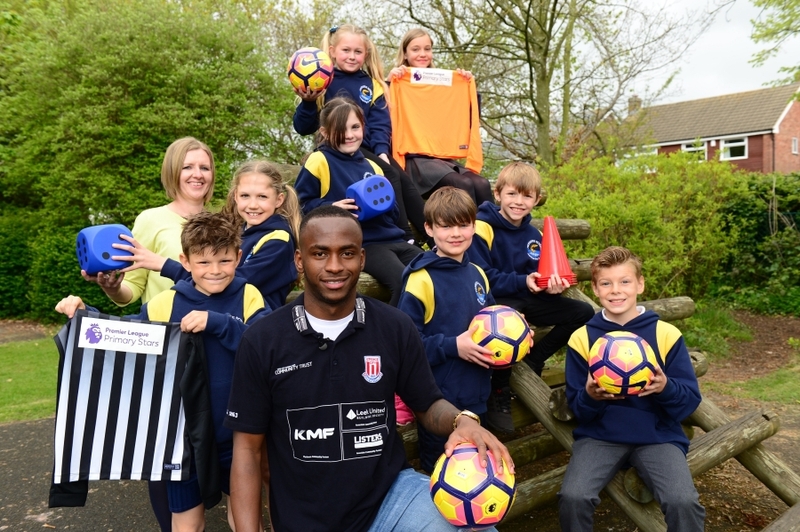 Premier League Primary Stars was helping to encourage discussion and new life-learning opportunities – just a few examples of such being fairness, sportsmanship, respect and freedom of choice. Such a simple thing as being able to independently choose which team you yourself support, and respecting others decisions to support rival teams – all explained in the context of the Premier League, which is part of UK everyday life whether you’re a football supporter or not. While chatting, the children had moved on – outside. Grabbing the opportunity before the great British weather intervened, Saido and the children managed to spend a little time getting some physical exercise. And as with football, when the cloud burst, the rain did not stop play. Fortunately, it was a quick shower, but enough of one to smudge the notes I was making on my pad (old school pen and paper note taking for me). I left Pikemere County Primary School with a smile on my face, damp hair and slightly illegible notes, convinced that Premier League Primary Stars is something that UK primary schools should get involved with. As a parent of a primary age pupil myself, I would be pleased to think my son had experienced what the Pikemere pupils had. I will remember that inspiring literacy lesson, and I have no doubt the children will too – for a long time to come. Would you like to learn more about Premier League Primary Stars and how you as a parent or school can get involved? Start here and then click on the links to go to the website and register your interest. Competitions range from national football tournaments to creative writing and reading challenges for reluctant readers. Registered schools will have the opportunity to apply for free kit and equipment and books from celebrated children’s authors. All schools that register receive a free values incentive pack with stickers and certificates to reward positive behaviour and achievements. I started reading this post with a skeptical eyebrow raised, but was actually pretty intrigued and sold with your story and the details of the program! Wow!